We cannot count the number of times we've been asked this question - when will Sinn produce a fully Tegimented, all black version of the standard Sinn U1 with a black Tegimented bracelet? And finally we can answer this question - now. Over the years, there have been several limited edition models of the Sinn U1 produced in a black case with different dials or hands, but never a flagship model with the true design of the Sinn U1. This is the first time that Sinn has produced a fully Tegimented Sinn U1 with an all black PVD finish, black bezel and classic U1 dial and hands. The new Sinn U1 S on black bracelet features the same great case design made in-house from German submarine steel at Sinn's case making facility in Glashutte, Germany. Once the case is complete, the Tegimenting process begins, and when we say "fully Tegimented" we mean what we say - case, crown, bezel, case back and even the anti-reflective coating. And unlike watches made in stainless steel, this watch case does not need to be rinsed with tap water with each exposure to a salt water environment since it is made from true submarine steel. The international testing lab of Germanischen Lloyd has tested the Sinn U1 S on bracelet, and determined that the watch can be certified as water resistant to 1,000 meters. This same firm tests submarines for their ability to withstand the effects of underwater use. Matte black dial with date at 3, SuperLuminova on hands and markers, and striking red seconds hand complete the design. Other features include sapphire crystal with anti-reflective coating, and black PVD stainless steel bracelet which is hardened using the Tegiment process. 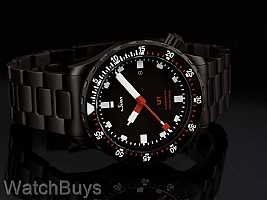 Be among the very first to own the new fully Tegimented Sinn U1 S on black bracelet. We know it's taken some time to release, but trust us that it was worth the wait. Verified Owner Comments: Very easy company to deal with, the watch arrived as expected in the time frame they told me to expect it. Very easy to talk with over the telephone if you have any questions or concerns. Would do business again in the future. "Wow...Even better than the original U1!" 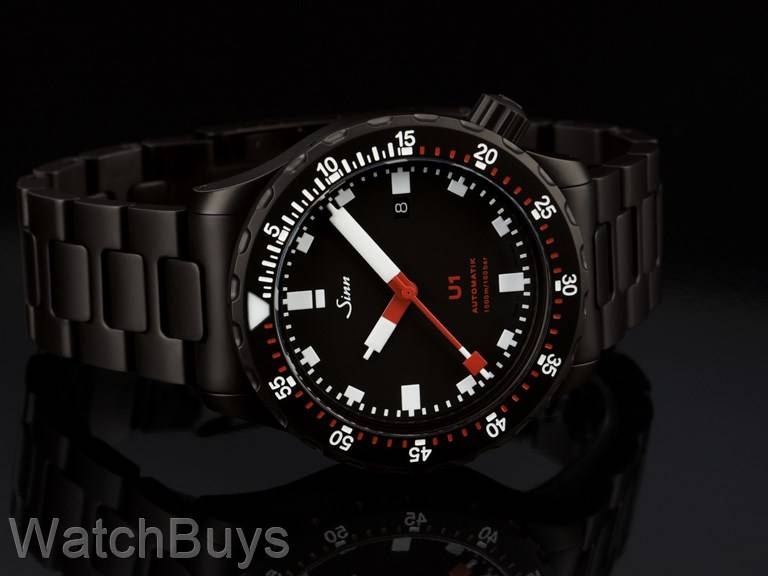 Verified Owner Comments: As a long-time owner of a Sinn U-1 on the dive band, pre tegimenting - I can say that the U-1 S may be even better than the original! The bracelet is very comfortable, balancing out the weight nicely (I find the original a bit top heavy without the bracelet). And it maintains the sporty, unique look of the original, but the red and white markings and accents on the face and bezel really stand out against the matte black finish. And the cool factor of the tech in this beast of a watch cannot be overlooked - submarine tegimented steel, 1000m water resistance, captive bezel...This watch is built to survive AND look good doing it!